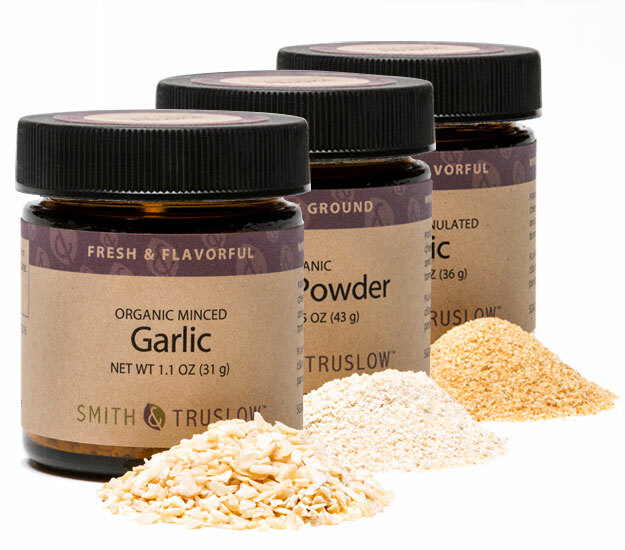 Granulated, minced or powdered garlic will all function the same as fresh garlic in just about any recipe. 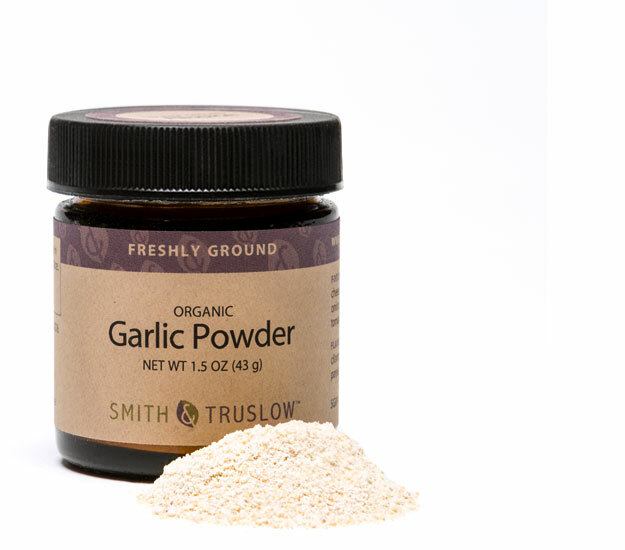 Powdered garlic dissolves almost instantly when added to a dish, either hot or cold. Portions of minced or granulated garlic take a few minutes to meld and release flavor. Use minced garlic in sauces, stews, and soups. Mix with oil and vinegar and spices to make salad dressing. 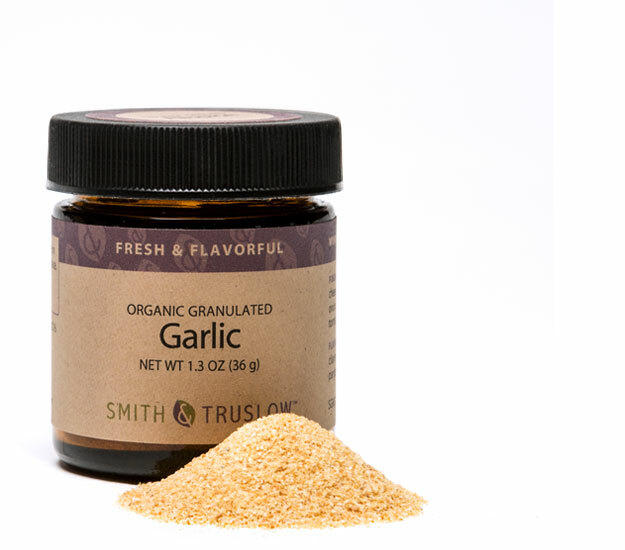 Garlic powder can be used in marinades, or mixed with herbs and used as a rub on poultry, pork, or beef before cooking. Organic garlic powder. Granulated garlic. Or minced garlic. Always strong, sweet, nutty, and onion-like, with a distinctive odor and flavor we can all relate to. Cajun & Creole - While the main staples of Cajun cuisine are onion, celery, and bell pepper, garlic is never far away from any Cajun chef’s kitchen. Caribbean - In the Spanish-influenced regions of the Caribbean, recipes feature a lot of spicy and flavored foods frequently heavily flavored with garlic and lime. Chinese - Two ingredients that are integral to Asian cooking…garlic and ginger. French - In France, you'll find garlic that is smoked, fresh, green, violet, pink, and giant… with regional specialties that include escargot with garlic and parsley butter and garlic soup! Greek - Greek cuisine features garlic more frequently than other Mediterranean cuisines. Skordalia, aka Greek garlic sauce is easy to make and goes with many Greek dishes. Indian - Onion, ginger, garlic and tomato form the base of many Indian curries. And naan bread covered in minced garlic and green onions accompanies many a spicy meal. Italian - In Italy, mostly in the South, garlic is used but always in moderation – raw, sauteéd (in sauces), or cooked for a long time in stews. Mexican - One of the most common flavors in Mexican food is garlic. You’ll find it in many recipes, like salsa, taco seasoning, and Spanish rice for just a few. Spanish - Garlic is considered an essential flavor in traditional Spanish cooking. The two basic ingredients of all Spanish food are olive oil and garlic. Vietnamese - Many recipes from southern Vietnam are created using liberal amounts of garlic, shallots, and fresh herbs. Garlic is the dried root of Allium Sativum, a member of the lily family. It is a close relative to the onion, shallot, leek and chive. Its use spread across the world over 5000 years ago (before recorded history). It was eaten by ancient Greeks and Romans and is still grown in Egypt, but the most favored variety now is Syrian. In the US, it was first cultivated in New Orleans by French settlers, and then missionaries brought it to California. Garlic is used in cuisines throughout the world, and it is indispensible in Chinese, Italian, and Mexican foods.